The Enviroweb channel protection system & erosion control mechanism consisting of a flexible and continuous protective lining based on the principle of ‘Confinement of fill materials‘. 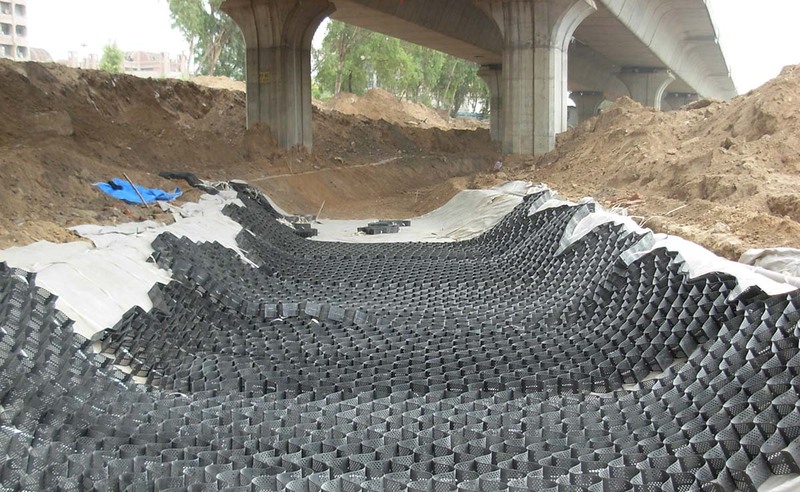 This methodology consists of honeycomb-like cellular structures joined together and filled with concrete to form a flexible, continuous, durable and zero maintenance bank lining which protects the bank from any further soil erosion. In case of any localized settlement on the bank slope or any the development of any undulation, this protective lining matches accordingly due to its flexibility. 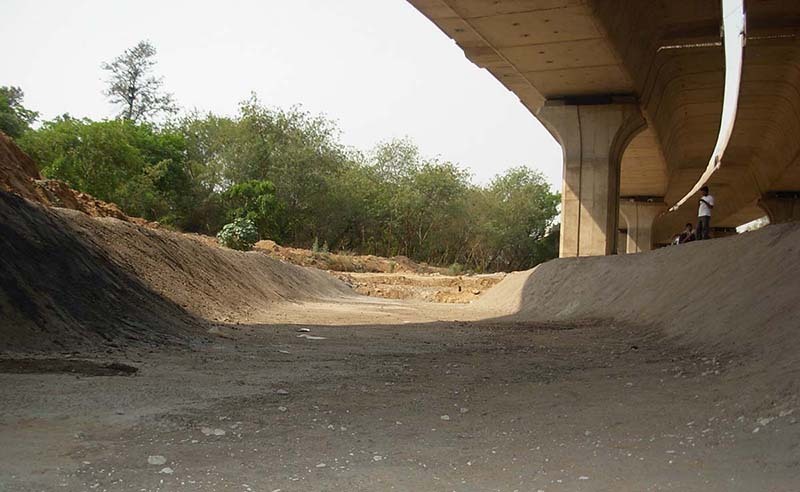 Enviroweb filled with concrete, produces a durable, erosion-resistant lining system of uniform thickness that retains flexibility and to conform to potential subgrade movement. The light weight and flexible lining adapts to a wide range of channel geometry. Normal drying shrinkage of the concrete infill material gives the entire lining surface an ability to drain ground water from the subgrade. 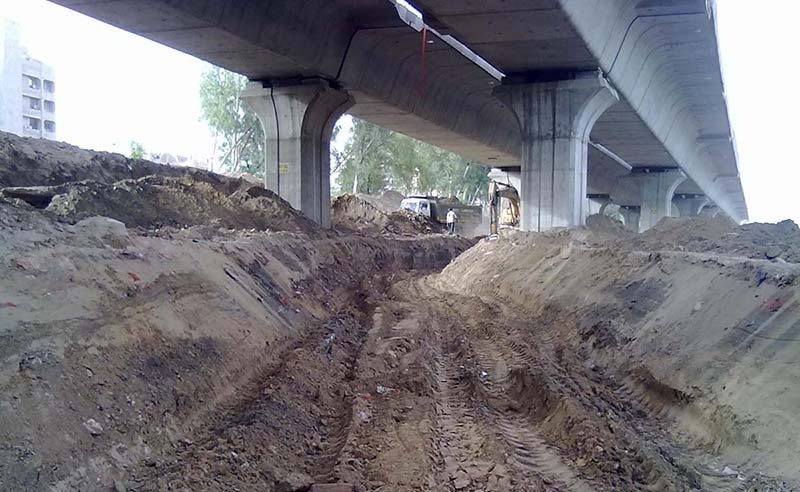 The uniformly distributed shrinkage also enhances the system’s ability to articulate in case of subgrade deformation or scouring on the channel bed and slope. Due to the textured sheets of the Enviroweb, a mechanical bond is maintained between the cell wall and concrete which locks the concrete infill into the individual cells of the system. Moreover the perforations allow cross-cell flow of concrete, providing superior locking of the concrete infill into the individual cells of the system. Thus the total system behaves as a flexible concrete mattress. The Enviroweb lining systems acts like a large single slab as the sections are tied togather and filled with concrete.